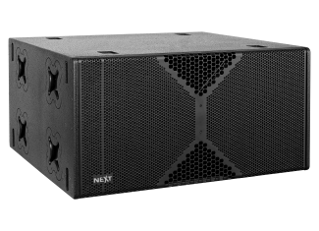 NEXT-proaudio has added to its Subwoofer range, the LAs418A, a new 2x18” active reflex subwoofer. Housing two long excursion and very high power B&C 18" drivers, this Subwoofer has been designed to offer ultra-low frequencies at a very high SPL. The new DPA4000 (power module with DSP) can deliver up to 4000Wrms with a magnificent precision and punch at incredible SPL. This new enclosure combines optimised acoustic, electro-acoustic and electronic solutions to maximise efficiency. 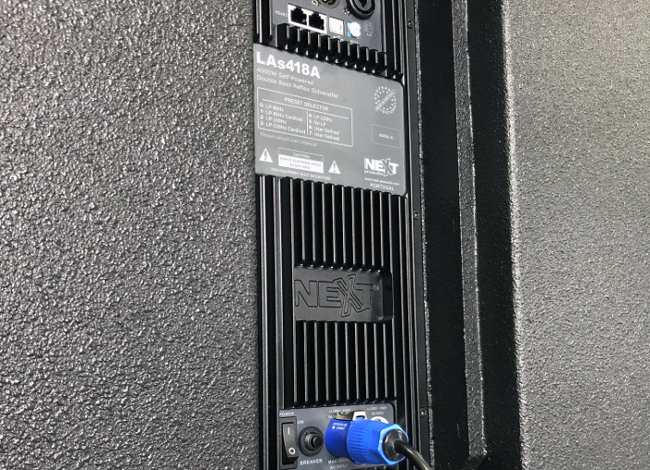 The heart of the new NEXT-proaudio powered speaker series, is a powerful, 4000Wrms, light weight, highly efficient Class D power amplifier module, with PFC switch mode power supply, that delivers an impressive sonic punch with perfectly balanced, rich and transparent, sound at any volume. The PC controlled networkable DSP 24bit/96kHz with A/D-D/A low noise converters, provides 8 selectable Presets (6 factory defined and 2 User defined) that can be accessed by an easy selector, located on the front module panel or real time edited by a PC, using the supplied Soundware II software, via RS485 or USB remote control. This permits to easily customize the sound program, for various applications or different venues. An intelligent automatic standby mode is activated when the amplifier detects no input signal, saving energy and extending the expected work life. With the Soundware II software is possible to edit the 6 pre-loaded Presets and store it in one of the two free memories. Editable parameters are: Input equalization, Input delay, Input High-pass/Low-pass filters and the "Bass Enhancer" function. A total of 255 units can be controlled simultaneously by the software. 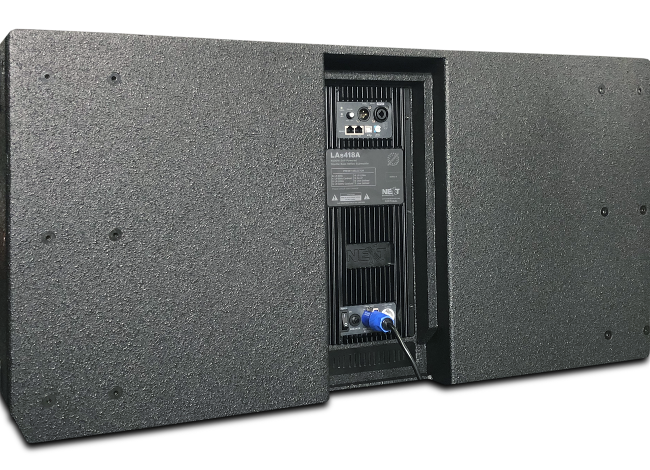 LAs418A subwoofer is versatile enough to address any fixed installation or rental application. Sound Designers, Engineers or Integrators can choose from standard or cardioid configurations, creating a variety of symmetric and asymmetric directivity patterns adapted to each specific solution. 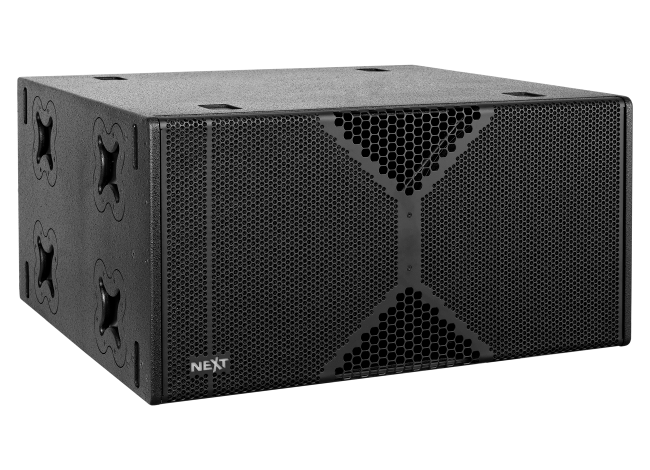 The cabinet volume with optimized port tuning featuring extremely high peak-to peak excursion capability, is capable to deliver true sub performance down to 24Hz at -10dB. Providing low frequency resolution and a maximum Peak SPL of 143dB in a 89kg, front loaded, bass reflex enclosure and measuring 1030mmx516mmx920mm (WxHxD), the new subwoofer version incorporates 8 handles, housed within a multi-laminate birch plywood enclosure and finished in textured black semi-matte coating. The new products are available for order immediately and will begin shipping in June. NEXT-proaudio 2005-2019. All rights reserved.